We hauled up our anchor in Isla Isabela while stars still hung in the sky. As is our routine, we put coffee on and let the sounds of the sea fill our ears with music. As the oranges of dawn rolled above the horizon, a pod of dolphins appeared in our bow wake. This is one of the experiences that brings Neil and I the most joy on passages, and we were over the moon to watch his mom’s face beam as she watched our new friends dance before our boat. In the midst of the moment, I leaned awkwardly against our port lifelines. The kayak strapped to The Red Thread’s stanchions dislodged and went flying off into the ocean! Thankfully, the seas were glassy calm. I was amused as I hollered back at Neil, whose “what the hell happened” expression lanced my giggling. We needed to retrieve our little boat! Neil slowed down and turned the helm. All the while, our dolphin pals continued to swim around us, seemingly undisturbed by the calamity. Given our time constraints, we debated between visiting San Blas or Chacala. The town of San Blas boasts interesting history, as well as a panga jungle tour, which made it a strong contender. Unfortunately, it is also known for hoards of jejenes (aka no-see-ums), nasty little biting bugs that have permanently limited San Blas’ appeal to tourists. The fact that I tend to wind up the entree du jour whenever no-see-ums are near dampened San Blas’ allure. Chacala won out for its reputation for charming beachfront palapas (i.e., beachside bar/restaurants with thatched roofs) and sandy shore. Our cruise to Chacala, a small beach town and a holiday favorite among locals, was peaceful. Sometimes on a passage, “peaceful” is a synonym for “winds were too light to fly our sails, so we had to motor the entire way”, which was the case in this instance. We caught a few bonito, a dark-fleshed (but still tasty if properly prepared) cousin of the tuna, and after playing a number of rounds of catch-and-release, gave up hope for a tuna or dorado and kept a bonito for dinner. Outlines of mountains that for hours had lacked definition began to take shape as gradients of darker and lighter blue emerged, adding depth to the hills along the coast of Pacific Mexico. Gail is riding comfortably atop the cabin, her pretty new sun hat shading her fair skin. She’s been there for well over an hour, watching the horizon creep closer, journaling about her time with us, and watching for whales. We lost count of how many humpback whales we saw. Each time we were certain we wouldn’t spot another, more spouts would erupt from the sea. 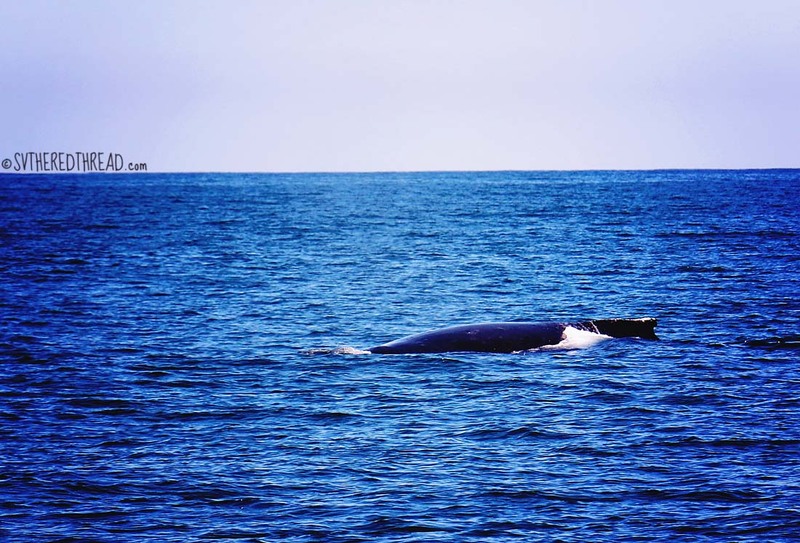 We hadn’t seen as many whales as we’d anticipated down the Baja stretch from Ensenada to Cabo San Lucas, and we were as exuberant to be enjoying the best whale watching of our journey with Gail. 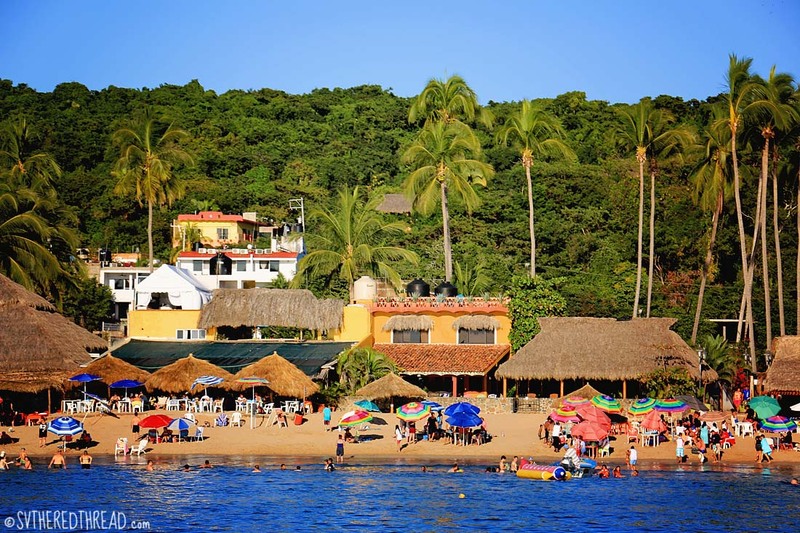 Chacala is a small, picturesque bay tucked behind the diminutive Punta Los Chivos. Holding in the sandy-bottom anchorage is excellent in 20 feet. 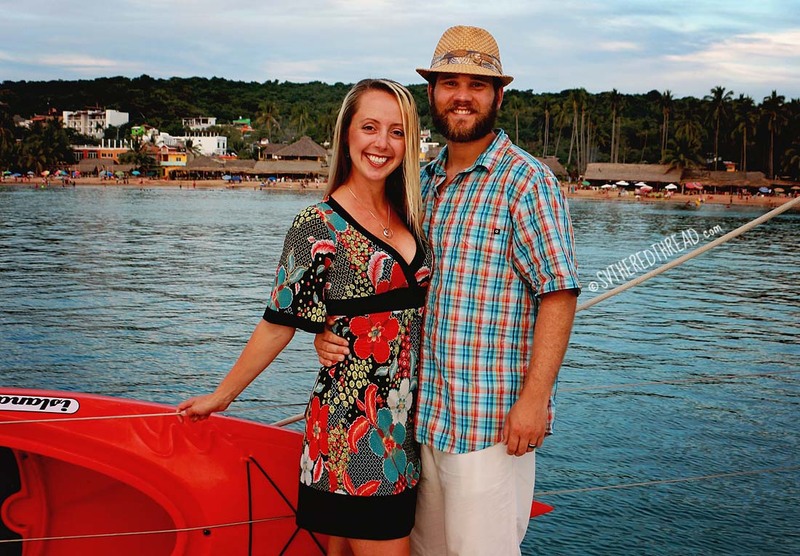 As we rounded the point, traditional music blared from palapas, and vacationers were towed screaming by speedy pangas as they clung to the top of what was unmistakably a hot dog floaty. The beach was flooded with colorful umbrellas and sun-kissed Mexicans, enjoying the stretch of holiday between Christmas and the New Year. It was anything but tranquil the afternoon we arrived, but it was beautiful. We dinghied to shore for margaritas, ceviche camarón, and a sunset over The Red Thread that rivaled any we’d seen on our way down the coast. 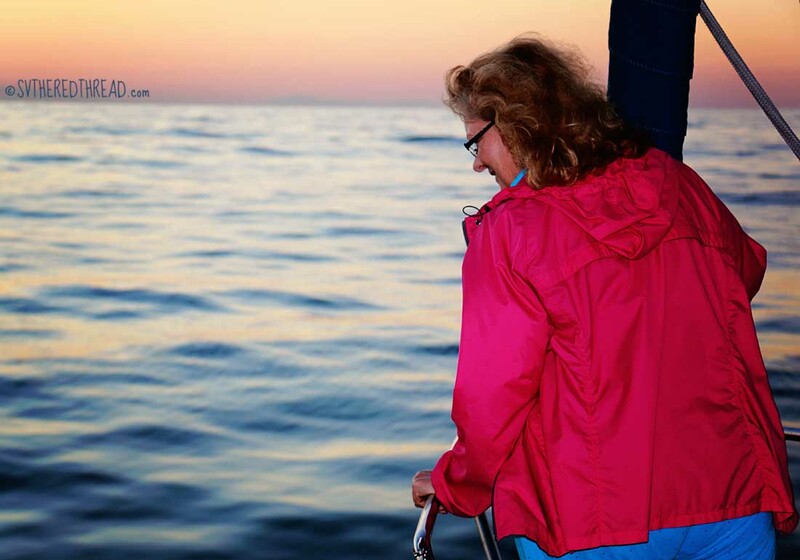 The following afternoon, Gail made herself comfortable aboard our round, American flag floaty and basked in the sun while she read a book, bobbing behind the boat. Neil relaxed in the cockpit, and I paddleboarded around the anchorage, where I met Dan and Marla, a friendly couple on a boat named s/v Long Windid. Unfortunately, we’d noticed yet another chafe point at one of the batten pockets on our mainsail, so our stop also involved more sail repair. This time my work was a bit more finessed than my initial work in San Diego. The three of us were freshly showered and primped, and the sunset dingy ride to the beach was gorgeous. Neil did his best to time our paddle through the surf, but alas we failed. We got pooped worse than ever before! Poor Gail was riding on Miss Sassy’s stern, and she got the lion’s share of it. Her brand new beach dress was utterly drenched! She was a trooper and, covered in salty stickiness, tried to make the most of our venture through the few shops that line town’s single road. We had hoped to venture in for a nice dinner on the beach, but it was not to be. Not unlike American festivities, pricey reservations were required. We opted to venture back to the boat, where Neil bartended and I did my best to make an authentic Mexican meal from scratch. Our menu consisted of exceedingly spicy enchiladas, homemade salsa, and guacamole. We weren’t certain whether we’d crossed over into a new time zone, but when an impressive display of fireworks began to erupt over the tiny beach community, we received confirmation. We had crossed over into central time. Feliz Año Nuevo! Bienvenido a 2015!! 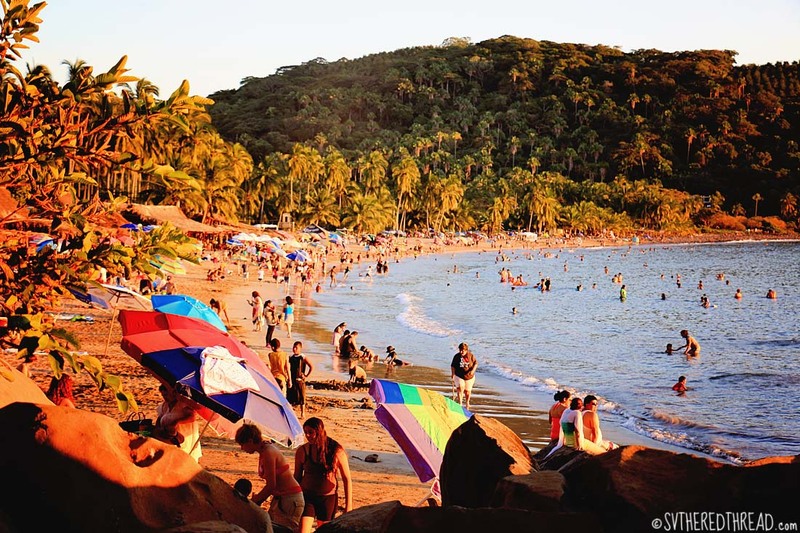 Jessie’s musings: Isla Isabela was a gem, but after two days, I was eager to see the sandy, palapa-lined beach I’d been fantasizing about during our trek from the Pacific Northwest. During our passage, there was one instance where we heard a loud roar over the engine that had all of our heads immediately spinning aft. A humpback had surfaced just behind the boat, her mighty blow yielding the explosion that demanded our attention. By the end of our passage, my left eye was twitching from trying to maintain a wink behind our camera lens – so many beautiful creatures to attempt to capture! The beauty of the whales was only superseded by the glowing expression on Gail’s face. 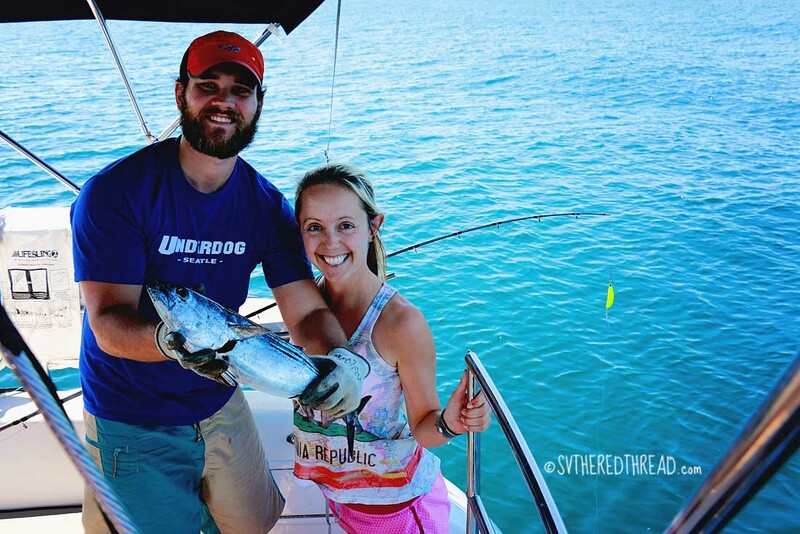 With the exception of catching a Dorado, her Mexican vacation was serving up all of the delights we’d hoped! Neil’s reflections: Leaving Isla Isabela was difficult for me. I truly enjoyed my time there, lost in what felt like the most beautiful remote location imaginable. The moonless, starry sky of the morning was lit up with mast head anchor lights from the surrounding boats and a line of lights in the distance where the hard working panga fishermen toiled. 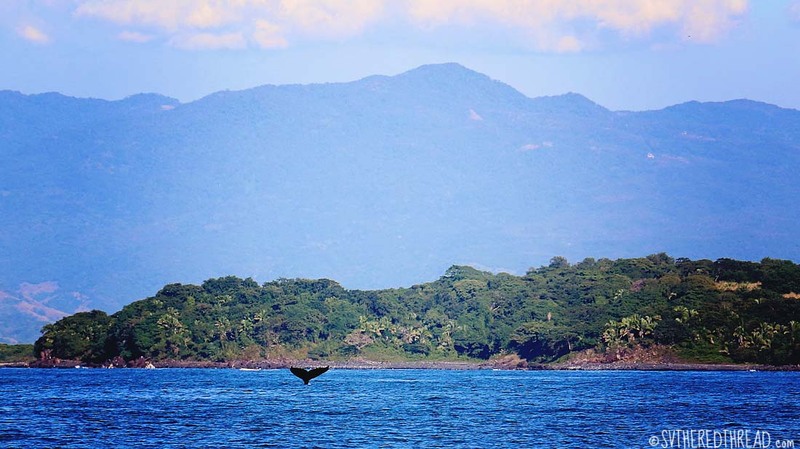 The passage to Chacala was wonderful, even if there was no sailing, and the “whale show” was the best we’ve had yet. The moment a mother humpback swam inverted at the surface and slapped both of her pectoral fins, signifying only she knew what to her companion whales, had us all in awe with silly grins on our faces. I have experienced nothing so humbling as seeing these enormous, beautiful creatures joyously mingling together and diving, breaching, fin and tail slapping, and otherwise doing exactly what they’ve done for the entire existence of their species – an existence far longer than that of humans. This entry was posted in By Jessie, Fishing, Friends and loved ones, Mexico, Passages, Sea life, South Pacific Stitch and tagged Chacala MX, Humpback whales. Bookmark the permalink. 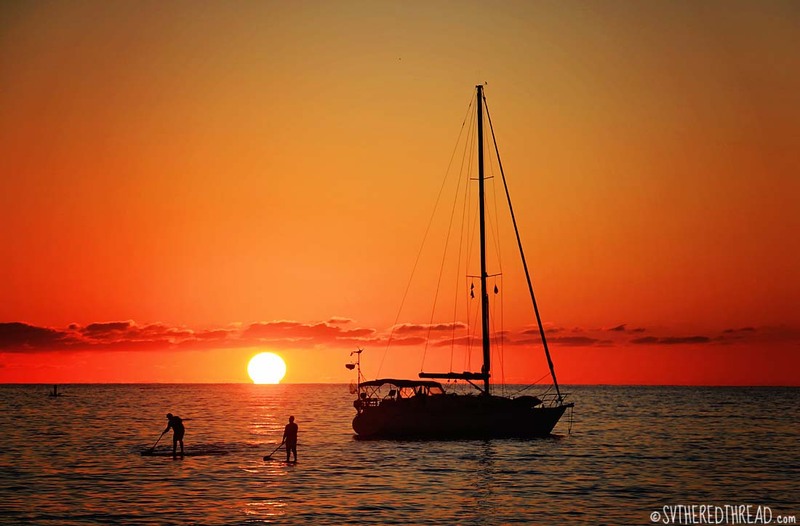 I love the last photo of your boat at sunset . . . kinda hard to imagine when it’s spitting snow outside. Enjoy the game tonight and GO HAWKS! It’s funny how foreign snow seems these days…I’m sure as foreign as 90 degree weather and sunny beaches, eh? Hope you are both doing well! And what a sad end to the season for the Hawks – great game though! No word of a lie, when I was reading one of your previous post I saw a picture of your kayak attached to the lifelines and thought to myself “that seems precarious especially in rough seas, they could lose that thing”. Then I thought I spied a stainless support bracket which was better than that we had on-board our bare boat rental in the Whitsundays. Still I could not be sure from the photo where the bungees were attached. I thought about bringing the idea of better lashing up but it felt silly. Nice that you got to practice a “Kayak overboard drill”. Curious, how it it lashed now?